An agreement has been signed between Pakistan Telecommunication Company Limited (PTCL) and NRSP Microfinance Bank Limited for the provisioning of ICT services. NRSP Microfinance Bank will utilize the IP-Connect for their primary network and satellite based DVBS-2 for primary backup. 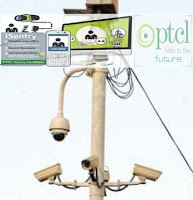 In addition, PTCL’s i-Sentry product line will be used to provide surveillance at NRSP branches. IP-Connect a layer III MPLS network will be deployed nationwide connecting the NRSP Branches with fiber based aggregation at the NRSP Head Office. PTCL is the largest national services provider with most number of physical and geographical PoPs across the nation. With PTCL’s MPLS network, NRSP can maintain its online communication within all the branches and beyond round the clock at a very economical pricing. Satellite based, DVBS-2 connectivity network for all NRSP bank branches scattered in different parts of the country will form the backup network. With the combination of MPLS and DVBS-2, PTCL will ensure 99.9% uptime for branch connectivity of the bank. DVBS-2 system is the latest technology in satellite based communications that is both reliable and cost effective. With I-Sentry services, PTCL will provide round the clock surveillance services for the branch network of the bank based on its state-of-art backend IP network meeting the current security requirements. The agreement signing ceremony was held at the NRSP Bank Head office Bahawalpur. What is PTCL i-Sentry Surveillance Service / System ? It allows customers to easily, quickly and cost effectively deploy network video monitoring at their offices, stores, manufacturing plants, shopping outlets etc. Live or recorded videos can be viewed using standard PCs, mobile phones, palmtops or laptops from anywhere in the world. i-Sentry-Economy designed for customers (individuals, small, and medium sized businesses) who require multiple un-interrupted surveillance of their private locations using a static Public IP. Maximum offered nodes: 30 Nos. i-Sentry-Premium Quality designed for customers who require un-interrupted video access between their offices over a secure private network dedicated for surveillance services only. Surveillance on a secure private link (VPN) with Committed Information Rate (CIR) between customer’s HUB and Node(s). HUB is offered on fixed 4 Mbps bandwidth while each node will carry 512 Kbps data rate. Packages require minimum two locations; one is designated as HUB where video streams from all locations shall be accumulated and rest are nominated as Node(s). Note: i-Sentry service only supports protocols required to run video and voice streams. Therefore service cannot be used for purposes other than surveillance. Camera Warranty: As per Manufacturer. The service is offered to clients by regional Key Account Managers (KAMs) through direct/personal contact.